New Orleans was once described to me as “The only city where you can smoke inside and drink outside.” Our lovely Big Easy is known as a place where the rules drift on by as you continue on your merry way. The same holds true for Jazz Fest. When you approach the gates lining the Fair Grounds, you hear the nondescript male voice on the speakers welcome you to Jazz Fest and tell you that there are, “No unauthorized vendors” allowed. 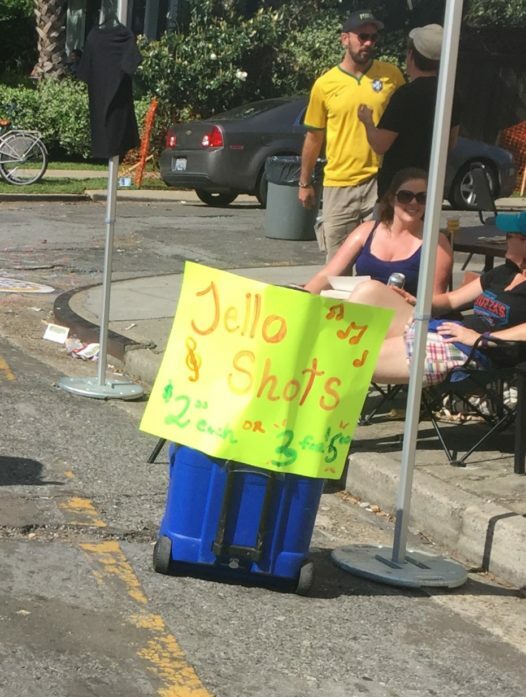 Then you look around and see Jell-o shot booths in the middle of the street, brass bands with a box out in front of them, or jewelry makers sitting on the corner weaving together their latest creation. There are individuals selling water, baked goods, and even kisses. Did someone really get a permit for selling kisses? Oh, did we mention that the kisses come from adorable puppies rather than the humans’ lips? What does the application for that permit even look like? Side hustling is a common phrase for many living in New Orleans. In fact, the usually blasé question of “What do you do for a living?” often sparks a tantalizing conversation when you talk to a New Orleanian. Answers like, “Well, I am a teacher, and I also make light-up paper mache hands for a Mardi Gras Krewe” or “I sell pizzas out of a pirate ship that we put on wheels. That’s, of course, when I’m not working at my non-profit job,” are unique but not necessarily uncommon. 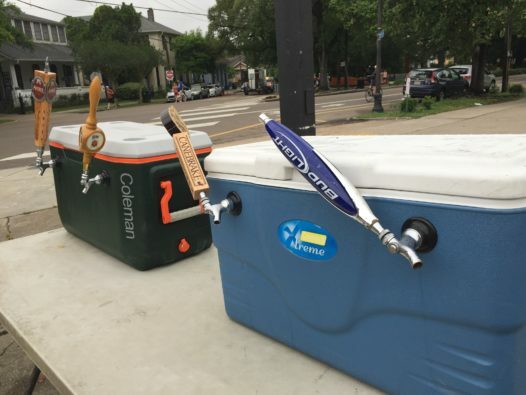 New Orleans is a city of rebels. It always has been. (I hope you are picturing Marlon Brando in the film adaptation of A Streetcar Names Desire.) And what causes this rebellious nature? Although Albert Camus never lived in New Orleans and was born in the 1930s, he seems to get New Orleanians and their rebellious ways. Maybe this is because he had a Spanish mother grew up in French Algeria and attended the University of Algiers. Spanish and French influence while learning at Algiers? It has all the details of a New Orleans story. More than his biography, though, it is his words the encapsulate that rebellious side of New Orleanians. As he so famously stated, “Every act of rebellion expresses a nostalgia for innocence and an appeal to the essence of being” and “Rebellion cannot exist without a strange form of love.” From outsiders and insiders alike, there is no argument that New Orleanians have an “essence of being” unlike any other city. So what about this “strange form of love” that Camus references? The vendors outside the gates of the Fairgrounds know one another, they remember each other’s children’s names, and there are always new reasons for new vendors to set-up shop. As one little girl turned to her mom and said, “Mom, we need one mimosa,” I had to turn and look. 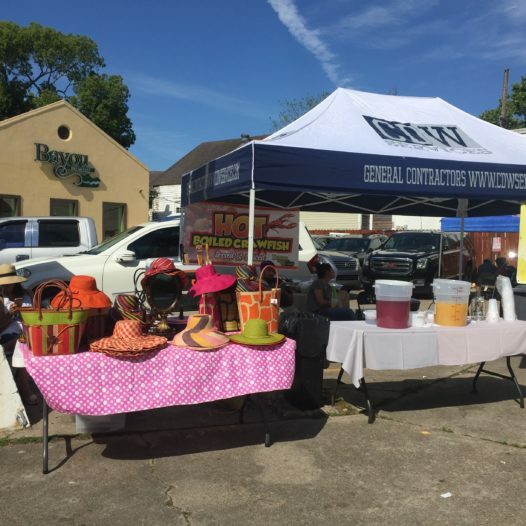 Parents and kids had set up a mimosa stand to raise funds for their kid’s school programs. Parents and kids selling champagne to fund education–we’ll go ahead and cheers to that beautiful rebellion. Now that Jazz Fest 2017 has officially started, we welcome the Hawaiian print shirts and floppy hats. We welcome the sunburned necks and muddy rain boots. We welcome those weird stick things with animals at the top used as location devices. We welcome the overindulgence of food and drink and music and enjoyment. And we definitely welcome all the vendors inside and outside the gates that are helping create a family, no matter what kind of rebellion it calls for.